MSRP excludes the Delivery, Processing, and Handling Fee of $920 for Cars (Yaris, Yaris iA, 86, Prius Prime, Prius Prime HB, Prius Prime, Prius Prime HV, Prius LB, Prius c, Prius Prime, Mirai, Prius Prime, Prius Prime HV), $1045 for Small/Medium Trucks, SUVs and Van (C-HR, RAV4, RAV4 HV, Highlander, Highlander HV, Prius Prime, Sienna, Tacoma), $1,295 for Large SUVs (Sequoia, Land Cruiser), and $1,395 for Large Truck (Tundra). (Historically, vehicle manufacturers and distributors have charged a separate fee for processing, handling and delivering vehicles to dealerships. Toyota's charge for these services is called the "Delivery, Processing and Handling Fee" and is based on the value of the processing, handling and delivery services Toyota provides as well as Toyota's overall pricing structure. Toyota may make a profit on the Delivery, Processing and Handling Fee.) Excludes taxes, license, title and available or regionally required equipment. The Delivery, Processing and Handling Fee in AL, AR, FL, GA, LA, MS, NC, OK, SC and TX will be higher. The published prices do not apply to Puerto Rico and the U.S. Virgin Islands. Actual dealer price will vary. Offer excludes applicable taxes, license, and fees. 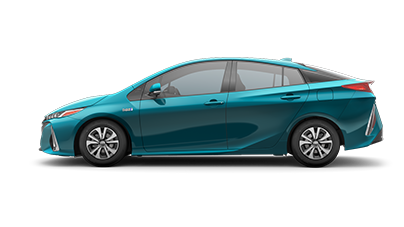 Lease is example only and applies only to new 2019 Toyota Prius Prime Model #1235. Lease available only through Toyota Financial Services to well-qualified buyers with premium-rated credit. No security deposit required. You pay excess wear and tear, plus $.15 per mile over 36,000 miles at lease end. Lease Cash is only available through TFS and must be applied to special lease offer. Lease payments may vary from dealer to dealer based on final negotiated price and equipment chosen. Example vehicle may not be available at all dealers. Must take delivery by 4-30-2019. Offer available only through Toyota Financial Services to well-qualified buyers with premium rated credit. 60 monthly payments of $17.92 per thousand borrowed. No down payment required if qualified. Offer ends 4-30-2019. Cash back available through Toyota Motor Sales and must be applied to transaction and cannot be combined with other offers. Offer ends 4-30-2019. Prime features visually striking Quad-LED projector headlights, available LED fog lights and accent lights to help you see more of what matters. Bright and efficient, the rear taillights are also equipped with LEDs that consume less energy. Prius Prime's purposeful, aerodynamic features include an active front grille shutter that shuts at high speeds, underbody covers, side body fins and exclusive dual-wave rear glass design, all of which help Prime slip through the air. There's a lot of innovation under the artfully sculpted exterior too. Optimized component placement - such as the battery pack - helps open up the rear cargo area and lower the overall center of gravity. Prime's loaded with innovative tech that you just can't miss. Its available 11.6-in. HD multimedia display is Toyota's most impressive yet. Intuitive pinch, zoom, tap and swipe gestures create a familiar smartphone-like experience while giving you easy access to the features that matter most. So whether you're using the available Entune® App Suite to plan your next night out, or using the navigation to help you get there, you've got the power to do it all, with just a tap. Prime's cabin features a modern design and premium materials throughout. Thoughtful interior touches delight the senses while smart tech brings convenience and innovative thinking to every trip. Prime's front seats feature deep bolsters for body-hugging comfort. When roads twist, these seats help keep you in place for extra confidence behind the wheel. The power of using less to get more. Prius Prime features a Toyota-first dual motor drive system that uses both motors to propel Prime. The result is a boost in acceleration feel, improved efficiency and the added benefit of EV Modeat full highway speeds. It helps deliver an exhilarating experience and makes the drive toward tomorrow even more exciting. Prime's double-wishbone style multi-link rear suspension helps you master those tight corners with ease. Its revised design expands cargo area space, which means you get an improved ride that's smooth and responsive with enough room to do more. More efficiency. More potential. Every last detail of Prius Prime has been optimized to help make it the most advanced - and efficient - Prius yet. 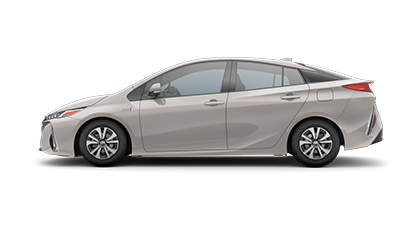 Cutting-edge, lightweight materials, proven hybrid technology and an optimized Plug-in Hybrid Vehicle (PHV) system all work together to help Prius Prime reach an impressive, class-leading EPA-estimated 133 MPGe. Prime also continues to help you challenge what's possible by reaching an EPA-estimated total driving range of 640 miles. Imagine all the places you'll go with Toyota's legendary hybrid technology that invites you to do even more. This available intelligent technology, called Predictive Efficient Drive, helps boost fuel efficiency by learning your routine stopping patterns. When approaching a recorded stop, an icon will display on the map of the navigation system and suggest the optimal time to release the accelerator. Regenerative braking also activates sooner to recover more energy for the hybrid battery. Take control and use your smartphone with the available Prime apps, including the Remote Climate app. This way, you can check your Prime's current temperature setting and change it to your liking-all before you even get in. When Prime is plugged in, the power used for Remote Climate is pulled straight from the grid so your battery keeps its charge. Now your comfort is always within reach. As you park, available Intelligent Clearance Sonar (ICS) is designed to scan for stationary objects like walls or posts that are within close proximity. If Prime anticipates a collision, an audible and visual alert will politely notify you, engine or motor output will slow down, and if needed, brakes will automatically be applied to help bring Prime to a halt. Available Intelligent Parking Assist (IPA) helps you navigate and conquer those difficult parking situations. Prime will automatically control the steering wheel, while you control the gas and brake, and help guide you into an open parking space.